There are no major economic reports being released today in the US due to the Labor day however, Markit/ADACI Manufacturing PMI and Spanish Consumer Confidence will be published in Eurozone. 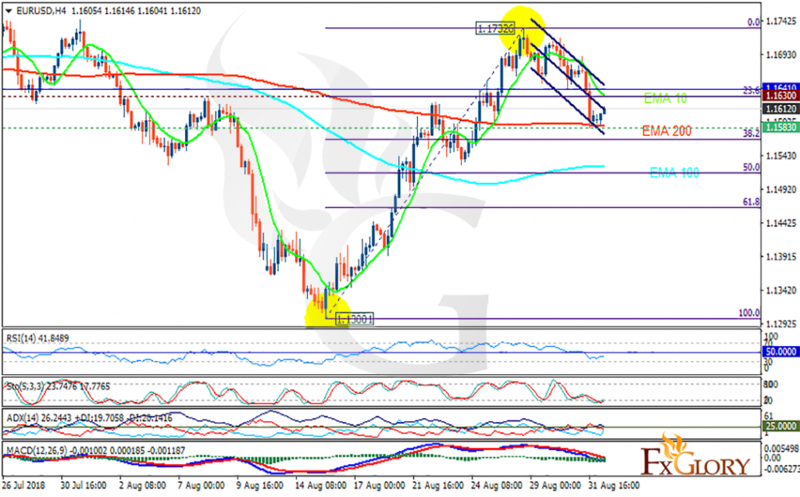 The support rests at 1.15830 with resistance at 1.16300 which both lines are below the weekly pivot point at 1.16410. The EMA of 10 is moving with bearish bias in the descendant channel and it is above EMA of 200 and the EMA of 100. The RSI is moving below the 50 level, the Stochastic is moving in low ranges and the MACD line is below the signal line in the negative territory. The ADX is not showing any clear signals. It seems that EURUSD has started its correction pattern, the support level breakthrough will confirm a bearish potential towards 50 level of Fibonacci at 1.15.